The future of Detroit’s museum district—an area within striking distance of the city’s revitalized downtown that has 12 cultural institutions—received bold ideas and insights into what urban architects and landscape designers would do if given the chance to unite Motown’s Midtown during an all-day series of presentations last week at the Detroit Institute of Arts (DIA). 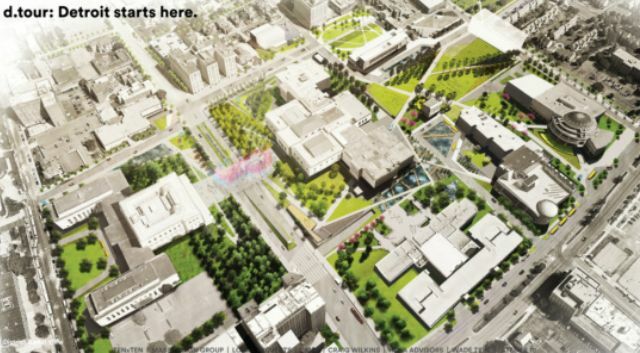 The DIA Plaza project hopes to create cultural, community, and city connections between institutions like the classical art museum and its illustrious neighbors, which include the main branch of the Detroit Public Library, Detroit Historical Museum, the Charles H. Wright Museum of African-American History, Wayne State University, and others. Three teams with international and national resumes as well as Detroit partners gave what observers called insightful and innovative pitches on how their ideas about mobility, technology and a revived infrastructure around the art museum could unite not only the buildings in the up-and-coming Midtown district but to the city and the region as a whole. The three presenters at last week’s event had a few items in common – namely, they suggested narrowing Detroit’s legendary Woodward Avenue to make it more pedestrian friendly, closing off little-used streets. The DIA and its local partners will select a winner from the three presentations by spring, officials said. Insiders say the final decision should come before the end of April.